It’s a real estate paradox: the most desirable places to live are also among the most susceptible to wildfires. 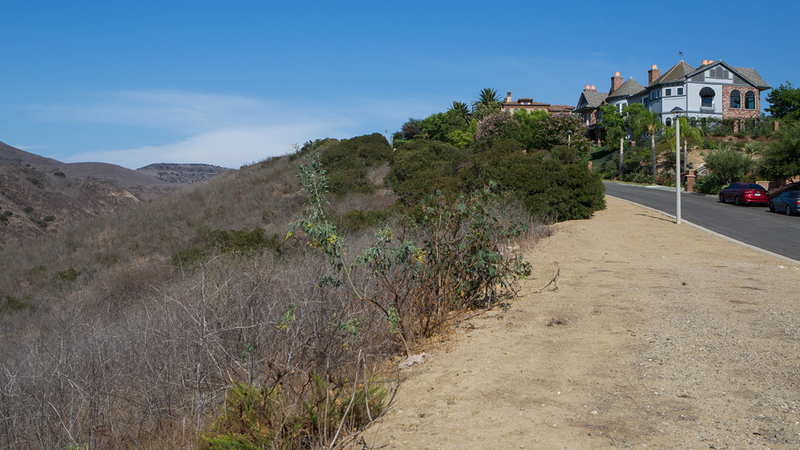 Mansions in the Santa Monica Mountains, tiny cabins tucked into the Angeles National Forest, and houses at the very edge of subdivisions are all beautiful because they’re surrounded by undeveloped land. But what makes them beautiful is also what makes them dangerous. That nearby wild land is highly flammable. Every year in California, there seems to be a bigger, crazier, more destructive wildfire. But every year, new houses go up in their path. 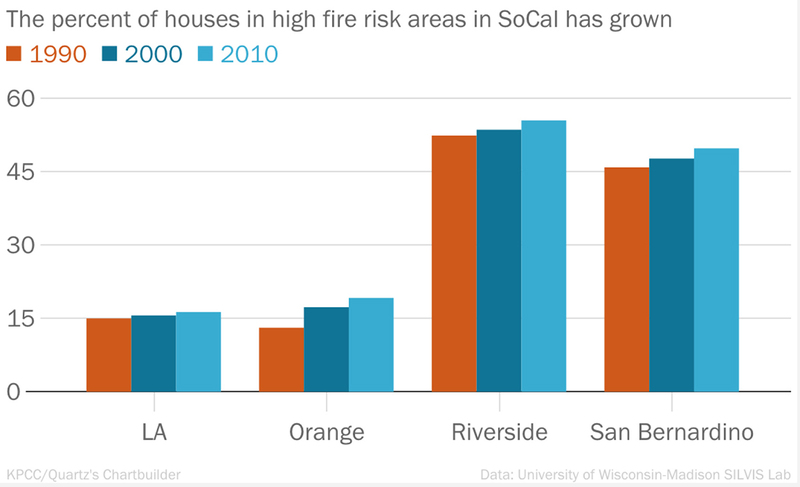 And it’s not just some houses, but thousands of houses — over 85,000 new houses in high fire risk areas in L.A. County alone, between 1990 and 2010. Shouldn’t we know better by now? 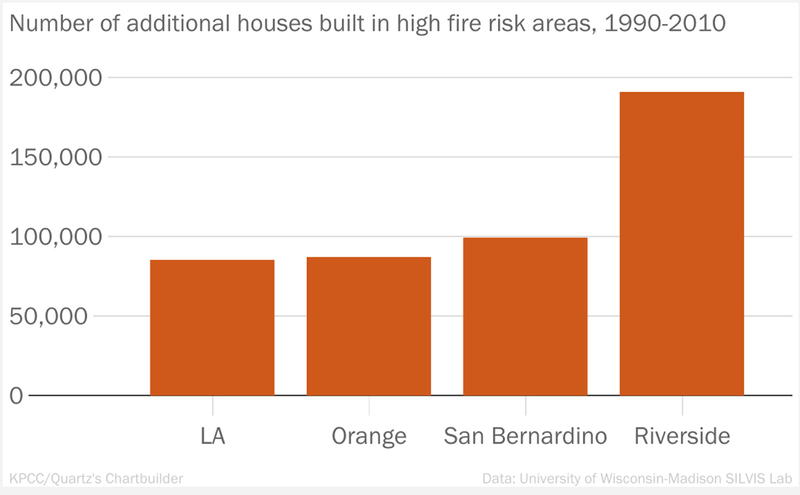 Why do we keep building houses in places that are likely to burn? I’ve reported countless wildfires over the years and this question continues to bother me. I finally decided to answer it. To do it, I decided to follow a new housing development that’s being proposed for an undeveloped patch of land in Orange County. It’s called Esperanza Hills, and it’s a pretty fancy development: 340 multimillion-dollar homes on a gated, dead-end street above Yorba Linda. It definitely fits the definition of high-risk — 10 years ago, a massive wildfire completely scorched the land it would be built on. And Cal Fire calls the entire site a “very high fire hazard severity zone,” a wonky term for an area that’s likely to burn again in the next 30 to 50 years. That matters because fire ecologists say where (not how) you build your house is the single most important factor in determining whether it will burn. “There are many cases where you can do everything right, but if you’re in a very risky location your house can burn down,” said fire ecologist Alexandra Syphard, who has been studying wildfires for 20 years. Building with modern, fire-resistant materials, clearing 100 feet or more of brush from around your house — those things can help, but if you put your house in a fire-prone place, Syphard says, they’re just Band-Aids. On Nov. 15, 2008, a small brush fire started near the 91 Freeway, a Santa Ana wind corridor. 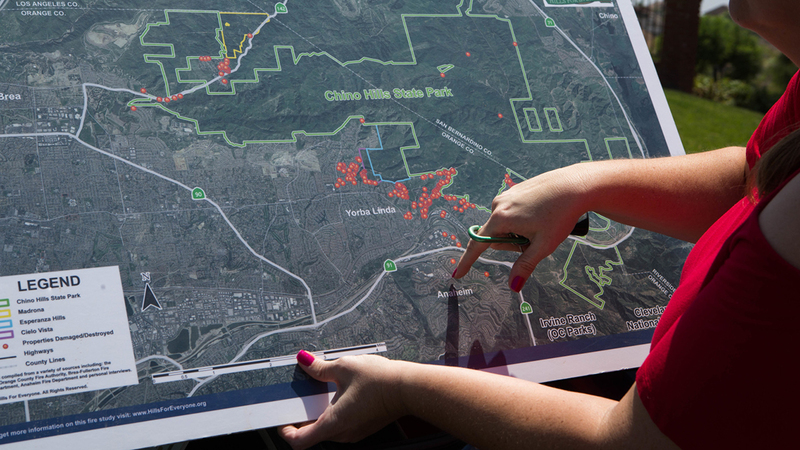 The fire raced west, scorching the entire Esperanza Hills site before moving down into neighborhoods and burning 381 homes, one of the most destructive fires in OC’s history. The evacuation was chaotic, recalls Ed Schumann, whose home burned down. Streets were gridlocked. Kids were running down the sidewalks with their pets. At one point, a teenage boy got out of his car to direct traffic, because no one else was doing it. To Schumann and other Yorba Linda residents, the idea of adding 340 houses worth of people and cars to that mess is frightening. “Evacuating that many more people with the same infrastructure, it’s a scary thought,” Schumann said. So, why would anyone want to build in such a risky place? I reached out to the developer behind the project, Douglas Wymore. He has his reasons. First, he believes he can build these houses, on this site, safely. And Wymore is doing a lot to protect it. All the houses will be “hardened,” in other words, built using fire-resistant materials as required by state building code, including sprinklers in the attic. He’s building at least 170 feet of defensible space around the homes. There will be two on-site water tanks for firefighting. And two entrances, one for emergencies, one for everyday use (local residents say this is insufficient, and point to the multiple tight turns on the main entrance, but Wymore is doing what is required under the county’s fire standards). Second, by building modern, fire-resistant homes in the path of a wildfire, Wymore believes he is protecting everyone else in the area whose houses may not be up to the latest building codes. The thinking being: his neighborhood will act as a fire buffer for older, more flammable homes. And third, he says, look, people want to live here. So that’s why the developer wants to build. But given the obvious risks, why would the Orange County Board of Supervisors approve this project? Well, to start, it will generate $8.25 million a year in property taxes. And ever since voters passed Proposition 13 in California in 1978, which limited how much someone’s property tax bill can go up each year, cities and counties haven’t seen their tax revenue increase as housing values rise. Oh, and there’s a little something else: Since 2011, Wymore has donated nearly $50,000 to the re-election campaigns of various members of the Orange County Board of Supervisors, none of whom agreed to talk to me for this story. Although none of the OC supervisors wanted to talk, you can get a pretty good sense of why most of them support it from things they said at previous public meetings about the development. One big reason is the classic private property rights argument: Wymore owns the land, and he should be able to develop it as he sees fit. “I don’t have any reason to now deprive someone of the right to use their property,” Chairman Andrew Do said at a May 2017 meeting. Another big reason? The fire department had given Esperanza Hills the green light. “If the fire department is satisfied, I’m not inclined to argue with them. I’m not a fireman,” Supervisor Shawn Nelson said. BUT WHY WAS THE FIRE DEPARTMENT SATISFIED? 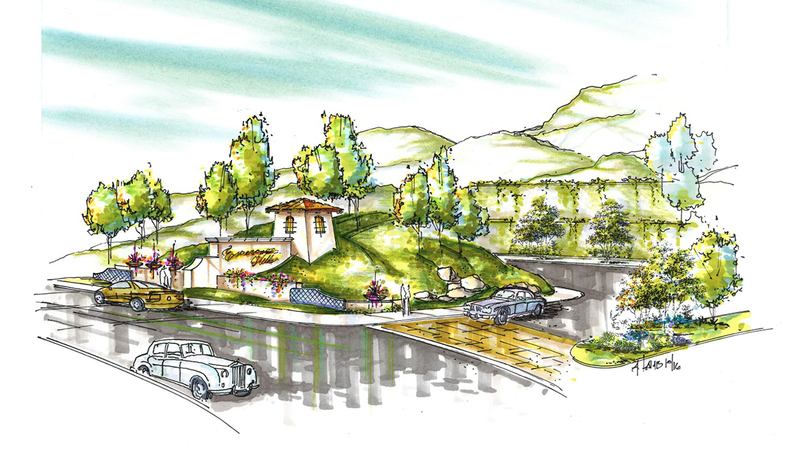 Well, according to deputy fire marshal Timothy Kerbrat of the Orange County Fire Authority, the preliminary plans for Esperanza Hills met all the state and local requirements for building in a high-risk area. “Do they have access, do they have water, do they have defensible space, do they have hardened structures that they can protect? Are all those things occuring? And in the Esperanza project, that’s the things that I’m seeing. That it’s occurring,” he said. (Side note: Although the Supervisors approved the project in May 2017, an Orange County environmental group sued, and a judge overturned the approval, which is why it’s back in front of the supervisors again this September). There’s another factor here: the Orange County Fire Authority will get just over $1 million a year in revenue from the Esperanza Hills project. And, mostly likely, the agency won’t actually have to spend much of its own money to protect this neighborhood if a large wildfire breaks out. That’s because state and federal agencies largely reimburse local fire departments for the costs of fire fighting. Back in 2008, for example, the Orange County Fire Authority spent $2.3 million fighting the Freeway Complex Fire, but they got reimbursed for 94 percent of the costs. “The irony is that we, as taxpayers, are paying for the protection of homes that are built in high-risk areas,” said Kimiko Barrett, a researcher at the Montana-based think tank Headwaters Economics. You read that right: when a big fire breaks out and threatens houses built in risky places, you and me are the ones picking up the bill. Kerbrat, the deputy fire marshal, vehemently denies that money or firefighting costs play any role in approving developments, by the way. Barrett, however, calls this situation a moral hazard. “The consequences actually aren’t borne by the people who are approving these developments,” she said. And it’s not just Barrett with this theory: it’s something the Office of Inspector General agreed with in a 2006 report. “If state and local agencies became more financially responsible for (wildland urban interface) protection, it would likely encourage these agencies to more actively implement land use regulations that minimize risk to people and structures from wildfire,” they wrote. But until this case of misaligned incentives changes, Barrett says we’re going to keep building in risky areas. Nearly 1 million new houses in California could be built in these areas before 2050. This story is part of an Elemental series “Fire in the Neighborhood” about fire danger in cities and surrounding areas. The post Why do we keep building houses in places that burn down? appeared first on Elemental.